h I wanted to call this dessert "Diabetic's Dream Pie". It contains so much carbohydrate that a big helping would be enough to put a diabetic into a coma. As a mild type II diabetic myself I made a huge sacrifice by trying this recipe out. 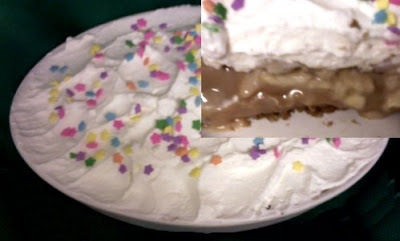 Banoffee Pie is a traditional English dessert and I want to thank Blighty's own Pat Pilcher for supplying the recipe that she makes for her own family. After the condensed milk has finished boiling, cool the can thoroughly, then open it and spoon the contents into the pie shell. The condensed milk will be caramelized. How could you do this to me Pat? I went completely off the diabetic diet wagon to try this! If Pat has any more recipes to offer, the principal ingredients had better be lettuce and fat-free yogourt! But seriously folks, if you like very sweet, heavy desserts you are going to absolutely love this one. If, on the other hand, you don't like very sweet, heavy desserts - avoid this like the Black Death!!! The McVities Hobnobs and Cadbury Flake are available at Blighty's Tuck Store. Buy lots, I have a hydro bill to pay! John.